Dimensions: Length: 52.73 m, Beam: 7.01 m, Draught 3.04 m.
Propulsion: Diesel; 2 Engines 16 Cylinders; General Motors Model 16-258S Serial No. 10878/10879 gearing 2.000 bhp, 2 shafts with 3 blade propellers. Range: 3.000 Nautical miles @12 knots. Armament: 1 3 pol. (76.2 mm/50) Oerlikon gun; 1 Bofors L/60 gun, 40 mm in one single mounting Mk 3; 2 machineguns Oerlikon 20 mm single mountings Mk 4; 2 grenade octuples throwers of A/S (LBG) 7.2 pol. Mousetrap Mk 20 at the bow ; 2 Depth Charges rack Mk 3 and 2 side throwers type K Mk 6 for Depth Charges Mk 6 or Mk 9. Sensors: 1 surveillance surface radar type SF or SL; 1 hull sonar. 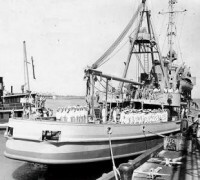 USS PC 607, was built at Luders Marine Construction Co., Stanford, Connecticut. 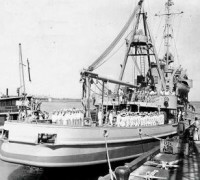 She was launched 11/Feb/43. 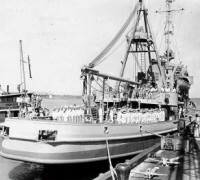 She was transferred and incorporated to the Brazilian Navy 19/Oct/1943 when was renamed as Guajara in a ceremony Miami, Florida.